Long time since I posted a Movie Poster. So here is one, a bit old but great comedy movie. This is one movie that all the kids and grown ups will like, specially the kids. I watched this movie during my school days. This is the movie that catapulted the Child star Macaulay Culkin. The movie is about the adventures of a 10 year old boy who is left behind home alone by his family in a hurry to go to the airport. You can't help but enjoy the way the kid kicks the butts of two thieves who call themselves the Wet-Bandits. Here is the dialogue from one of the best scenes in the movie. Pizza Boy: It's Little Nero, sir. I have your pizza. Johnny: Leave it on the doorstep and get the hell outta here. Pizza Boy: Okay. [puts down the pizza] Well, what about the money? Pizza Boy: Well, you'll hafta pay for your pizza, sir. Johnny: How much do I owe you? Pizza Boy: Uh, that'll be $11.80, sir. Johnny: Keep the change, ya filthy animal. Kevin: (comes out from the door and grabs the box) A lovely cheese pizza just for me! 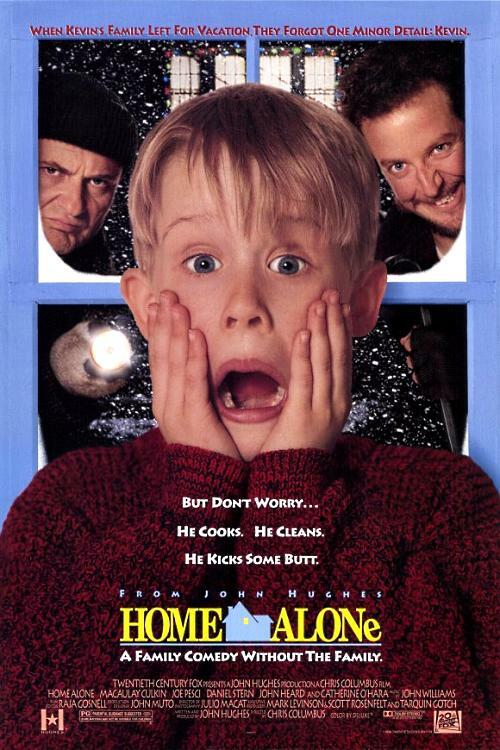 The movie which Kevin(Macaulay Culkin) the boy in Home Alone watches is actually a parody made specially for Home Alone.